Many governance, risk, and compliance (GRC) projects fail because they’re deployed to support a specific compliance need or to meet the requirements of a specific department. 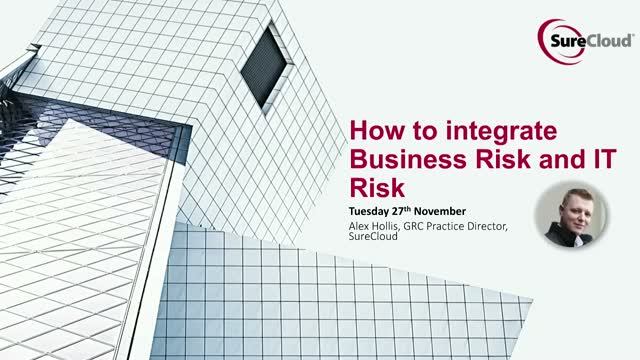 In this webinar, SureCloud’s GRC Practice Director will discuss taking an integrated Risk Management approach, connecting Business Risk and IT Risk. The Senior Managers and Certification Regime (SMCR) presents some unique challenges to any financial services organization with the focus being on protecting consumers’ interests. With the implementation date set for December 2019, the countdown is on. In this webinar Baringa’s Senior Managers, Stephen Humphreys and Edouard Bassil will be discussing how FCA regulated firms should be preparing before the deadline. SureCloud’s Product Director, Alex Brown, will demonstrate how a suitable solution can operationalize your process and aid your compliance journey. •What actually are reasonable steps? Do I need a paper factory? •Can I be compliant by implementing a few new templates and input from a few people part-time? •Where are my biggest implementation risks? What might I get wrong? •How do I get value from the regime and my implementation approach? Currently, 75% of cyber-attacks start with social engineering. It is this part of penetration testing that centers around manipulation and deception, rather than trying to outsmart a machine. It is just as crucial to improve an organization’s security posture as it is to probe a network for vulnerabilities. But what does it look like in practice? Join SureCloud’s Operations Director (Cybersecurity), Luke Potter, as he discusses his research into social-engineering techniques. Two-thirds of data breaches occur due to an insecure or poorly managed third-party relationship. Gaining control over your network of vendors is a critical risk activity. Join Alex Hollis, SureCloud’s GRC Practice Director as he discusses efficient and effective information gathering from third parties. Alex has over 16 years’ experience in IT, mobile technology and software development. He has spent the last seven years specializing in governance, risk, and compliance (GRC). The Open Web Application Security Project (OWASP) is developing version 2.0 of their Software Assurance Maturity Model (aka SAMM), and Chris Cooper, SureCloud’s Cybersecurity Practice Manager is part of the team currently working on the core model, with a focus around the new ‘Implementation’ business practice. In this webinar, Chris will be discussing the history of SAMM, evaluating the version 2.0 core model from a technical perspective, and the process that the SAMM team are undertaking. Chris Cooper is a Tigerscheme Senior Security Tester (Web Apps) and a CHECK Team Leader. Vulnerabilities exist in every system, and for some, the impact of an attack could be catastrophic, even business-ending. Often, these incidents are the result of a vulnerability that could be identified in a penetration test. In this webinar SureCloud’s Cybersecurity Practice Director, expert Penetration Tester, Luke Potter will discuss some of the real-life cyber-attacks his team has conducted including the work they have done with the BBC, Daily Mail, and Which? Magazine. Luke Potter is a CHECK team leader, Tiger Scheme senior security tester, ISO 27001 lead auditor and Microsoft Certified enterprise administrator. SureCloud's Cybersecurity Practise Director talks avoiding the pain of managing penetration test outputs in static PDF documents. Effective management of penetration test remediation activities. Demonstration of improvement and benefit following penetration test delivery. Why a better approach is needed to penetration test, specifically running it ‘as a service’ based engagement. Tracking, trending and analyzing data between multiple testing projects. • What organisations need to do to prepare for the GDPR? We will also provide a demonstration of SureCloud GDPR Suite that help organisations to achieve and maintain compliance with the regulation. The deadline to comply with the European Union General Data Protection Regulation is May 25, 2018. Non-compliance could result in hefty fines to your company and impact your ability to do business in the EU. With calendar year budget planning now underway, this webinar will help you build the case to fund your GDPR project and gain alignment within your organization. You'll also get a demo of the Cloud-based SureCloud GDPR Suite. Deadline-driven demand will surely drive costs up so the time to act is now to secure both your funding and resources. If your organization stores, processes and transmits cardholder data, PCI’s big brother - the EU General Data Protection Regulation - could affect your ability to do business in the EU. Impacted PCI US companies may have EU residents as employees or customers. The GDPR has become a primary item on most organizations' agenda this past year, yet a disproportionate amount of focus has fallen on the fines that are set to come in force May 25, 2018. We want to take a more optimistic look at the regulation, why it came to be and how it can be a massive opportunity to strengthen your reputation and (re)gain customer confidence. We will also look at how the implementation and ongoing maintenance of compliance can be addressed through an analytical approach to the Articles themselves; the rules of the regulation. • How US ecommerce and other companies involved in payment card transactions can be impacted by the GDPR. • Why the world’s most valuable resource is no longer oil, but data. • Why the GDPR is far more than a simple check-box compliance exercise. •Why the GDPR is a massive opportunity in disguise for organizations who take it seriously. •How the GDPR aims to change company culture by turning risk assessments on their head. •An analytical breakdown of the GDPR Articles that uncovers those that are applicable to your organization, and how to tackle these through a risk based approach. •Key areas of focus for any GDPR program based on personal and client feedback. •How to effectively implement GDPR by expanding upon existing compliance programs and management systems (ISO 27001). Stephen Bailey, Head of Privacy at NCC Group, Terry Blake, SureCloud EVP – North America, and Nick Rafferty, SureCloud COO. Exactly one year from the date of this webinar, the General Data Protection Regulation will take effect in the European Union. The GDPR applies to any organization that stores, processes or transfers the personal data of residents within the EU. It includes organizations located in and outside the EU. Non-compliance can result in fines of more than $20 million or 4% of worldwide revenues, whichever is greater. A recent survey found an alarming percentage of US-based companies are planning to reduce their presence in Europe or exit the European Union altogether rather than deal with the GDPR. Instead of tossing up their hands over the GDPR and going home, strategic US companies can follow the defined steps and adopt software solutions that can bring certainty to these uncertain times. In fact, they see another company’s exit from the EU as a potential opportunity to gain share. The good news is that you’re not too late in getting started to meet the GDPR deadline. But as the countdown begins, urgency escalates. The time to act is now. Agenda includes plenty of time to address your questions. In today’s interconnected world, organizations struggle to adequately govern risk in third party business relationships. Over half of the organization’s insiders are no longer traditional employees. Insiders now include suppliers, vendors, outsourcers, service providers, contractors, subcontractors, consultants, temporary workers, agents, brokers, dealers, intermediaries, and more. Third party problems are the organization’s problems that directly impact brand, reputation, compliance, strategy, and risk to the organization. Join Michael Rasmussen, The GRC Pundit of GRC 20/20, and Nick Rafferty, SureCloud COO, to get an expert view of the challenges companies face and how to gain certainty amid an uncertain web of complex, global relationships. Many organisations transfer personal data across borders to both EU and non-EU recipients. The EU General Data Protection Regulation (“GDPR”) imposes strict rules about how such data should be transferred, and applies to many unsuspecting non-EU organisations. Join Tim Hickman, GDPR Expert at White & Case LLP and Richard Hibbert, SureCloud CEO, to get the legal perspective on personal data transfers under the GDPR, and practical guidance on how this issue affects your business. Explain what constitutes a data transfer (you may be surprised). Identify the different types of data transfer (e.g., internal transfers within a corporate group; external transfers to service providers; etc.) and examine the implications for businesses. Examine the pros and cons of each data transfer mechanism (example consent, adequacy, Model Clauses, Binding Corporate Rules, etc.). Provide hints and tips on how organisations can prepare for data transfers under the EU GDPR. The GDPR comes into force 25 May 2018 and this will have a significant impact on the way in which organisations collect, process and share data. Companies that fail to prepare for the GDPR risk incurring hefty fines of 20m euros or 4% of world-wide revenues, whichever is greatest. As such all organisations need a strategy for GDPR. By implementing a structured approach through the use of cloud-based applications, organisations will be able to effectively achieve and maintain compliance. In this webinar we will: explore the key provisions of GDPR, examine the challenges organisations are facing with the new rules, provide guidance for Risk Managers, Compliance Leaders and other IT Professionals on how to approach these challenges, then demonstrate how our cloud-based GDPR Applications Suite can provide effective solutions that ensure your business can achieve and maintain compliance. Learn how to detect, prevent and mitigate ransomware attacks. Our experts will cover: the current mitigation strategies, how they are bypassed and why, how attackers perform directly targeted attacks and why it's time for organisations to simulate their own attacks. SureCloud has worked with key ISF community members to develop an application (Risk Manager for IRAM2) that helps to consolidate the IRAM2 risk assessment process. This application complements the ISF's world class methodology that help risk practitioners as well as other business and technology leaders to apply a simple, practical, rigorous approach to managing risks. Policy is the corner stone of any risk-based security programme. Policies are put in place not only to govern the way organisations operate, but also to mitigate risks, and as such require board level backing and sign-off. Yet when it comes to security programmes information risk, both internally and externally, is often presented in terms un-meaningful to the board of directors. Using real world example, this session will present a model for effective risk-based security that engages senior executives. The confluence of sophisticated cyber criminals, white hats and technological change means organisations are increasingly exposed to weaknesses and vulnerabilities in their networks, devices and applications. With a combination of expert security commentary and vulnerability trends, SureCloud will reveal the sophisticated nature of the latest attacks and what the future may hold. We will focus on modern exploits that go beyond the typical network and web application attack vectors. SureCloud will describe how organisations need to change their attitudes to security testing, considering the frequency and scope of assessments, and act on results in a timelier manner. Internal audit is in a constant state of transformation. Audit departments are being asked to do more audits, provide assurance on business operations and risk management, evaluate compliance, and advise the organisation with limited audit resources. They are challenged with a growing array of audits that go beyond financial audits to provide assurance through IT audits, operational audits, quality assurance audits, third party audits, and more. This demands that Audit have processes supported by an information and technology architecture that drives efficiency, effectiveness, and agility in audit processes and tasks. This webinar details how organisations need to take an agile approach to internal audit management that allows for a growing array of audits on an agile information and technology architecture to support internal audit management activities and reporting. SureCloud provides Cloud-based GRC Applications and Cybersecurity Services that help our customers achieve an integrated approach to managing their risk, compliance and information security. The SureCloud Platform is simple but powerful technology that gives our customers a single source to view and manage GRC and cybersecurity processes from anywhere in the world. Our customers benefit from automating formerly spreadsheet-driven processes but increasingly from addressing strategic initiatives such as the EU GDPR, ISO 27001, IRAM2, NIST, PCI and others.